like one column cw one WW and separate pads for both colors? what about tint mixing on this board with separate LED pads for 2 colors like one column cw one WW and separate pads for both colors? You can tint mix freely in any places with almost all 757 family except Optisolis. Mixing between CW/WW Optisolis can only be done between series strings. Not with this one. This MCPCB designed mainly for cost saving, voltage/LED choice flexibility, and easy application. Really want to buy a light bulb made with this. This is pretty cool! Any ideas on how this can be used in a portable setup? Is there any suitable сooler and optics for this dimension?at ali or other shops? Without modification, this would need a 46.6mm diameter cavity in a flashlight to accommodate the board. Obviously, this would be a mule/full-flood setup as any functional optics would have to be massive. When I said “cost effective” I really meant it. With 5steps R70 or R8000 GR-V3 you can get the MCPCB + 36pcs LEDs for as low as $5 ($7,15 for GR-V3 R95). R95 rank is already very close to Optisolis, especially at warm CCT. GR-V3 R95 ranked above E21A and below Optisolis. 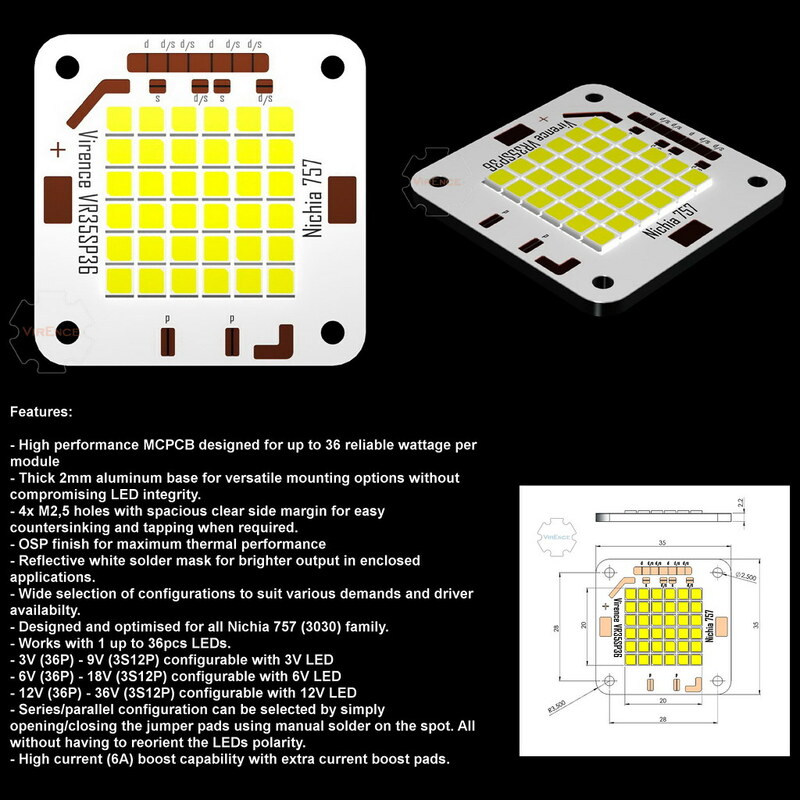 With Optisolis the board will cost $16,24 – $22,4 (MCPCB + 36pcs LED), CCT dependent. Add + $5 per board if you want me to solder them all. But seriously, soldering 757 LED family is very easy unlike E17A or E21A. You can save your money by using Optisolis only in certain areas. The cost/CRI point is still too high. I held back from trying the new Optisolis COB because it’s very expensive, and as per now, only comes in limited CCT (AFAIK, 3000K/5000K) and 36V only. would this be as in a flashlight you mean too?. The format is not very convenient for me but a dense linear module that I could use instead of a flexible strip would be useful. Would it work in a sofirn sp36? R95 in 3000K looks like a great value indeed! I’d be curious to see a tint mixed R95+Optisolis in the low CCTs. There’s a small chance they may compliment one another in the blue/cyan region. It appears there might be a slim possibility to adapt to automotive 12v applications… it seems not designed for 3v emitters in series…am i wrong? Due to the orientation of the image of the MCPCB, I was reading those pad labels as “d” and “d/s”. I thought there was some cruel calculus joke going on (thinking d/dx). Nope… Those are probably “p” and “p/s” for parallel/series, huh? The boards are still in the making, delivery schedule is 190515. Crash test will follow later. I still have no idea what is the maximum wattage this board can handle. Nothing fancy here, just normal good quality MCPCB. I’m getting to like mid power LED these days. Spent few weeks designing the boards and browsing through hundreds of pages of data sheets for a project (that led to this VS35SP36). And as I dug deeper, I like the idea even more. I know the idea of high efficiency lighting is not widely appreciated in BLF but here’s my thoughts to share. The beauty of mid power LEDs are: low power – low cost – high efficiency – power in numbers. Of course you can get the same output from a single XHP70.2 pushed very hard, but there’s no way you can get the efficiency (wattage/output, cost/module) of multiple mid power LED. I don’t see any benefit for manufacturers to use high power LED in general lighting unless smaller form factor is to be desired. Especially driven at below to max OEM rated current for reliable and predictable L70 life. 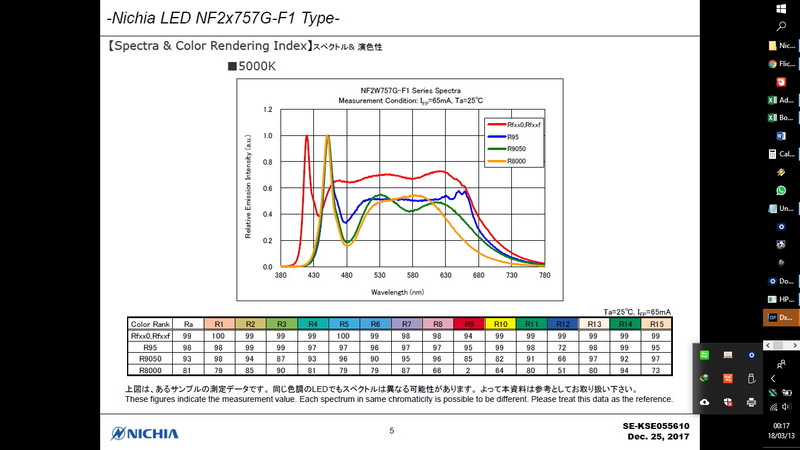 This explains why more than 80% of Nichia’s LED sales come from low to mid power LEDs. I believe the same also applies to Cree and other manufacturers. With high power LED, you can get slightly higher efficiency than mid power LED if they’re driven at the same low current. But what’s the point? At whooping 10x – 20x the cost? Development in high power LED is very similar to F1 racing. While mid power LED development is closer to 24 hours Le Mans racing. The latter has more real world applications. It would takes years before F1 technology applied to your public bus transport. High power LED development from version 1 to version x doesn’t attract manufacturers to get the newest LED. For example the move from 319A to 319B, or XHP70 to XHP70.2 only gain marginal efficiency (within OEM spec), too small to think about for most luminaire manufacturers. Perhaps the most significant gain is the beam quality, not the efficiency. On the other hand, flashlighting is very similar to premium super car world. Anything faster or better, even those with decimal point advantages are still the better choice. See? There’s no way high power LED will win over mid power LED in terms of cost or efficacy. 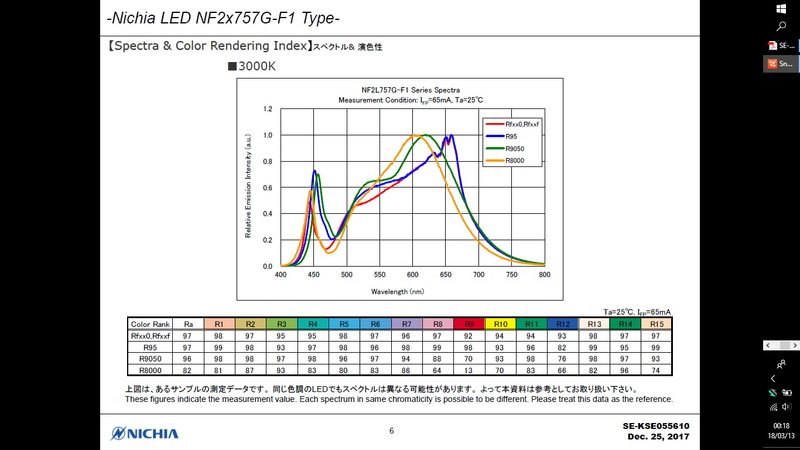 And FYI, almost all higher current LED driver are more pricey than their lower current output counterparts. Can’t please everybody all at once. But don’t worry, I already made a design for linear 150mm x 15mm 757 MCPCB waiting to send to the factory. I already made a design for linear 150mm x 15mm 757 MCPCB waiting to send to the factory. Quite wide. Most LED strips are 8 mm. 10 mm is rarer but nevertheless well supported. It’s not that finding a profile for a 15 mm PCB would be impossible but there are far fewer options. Just ordered a host for one of these. Just need to change the lens and swap the driver. Planning 36 4000k optisolis in parallel. Is running a 7×7135+fet driver with a 30q battery OK? Wait, is this an MCPCB for 3030 LEDs? And what are they? ?